WDC went foraging in October. We found quince, crab apple, rowan berries, hawthorn berries, chestnuts and wild dog rose hips – all harvested for free locally. The quinces made brilliant compote, the crab apples have been included in hedgerow jam and hawthorn jelly. The chestnuts we’ll keep for roasting on Halloween. 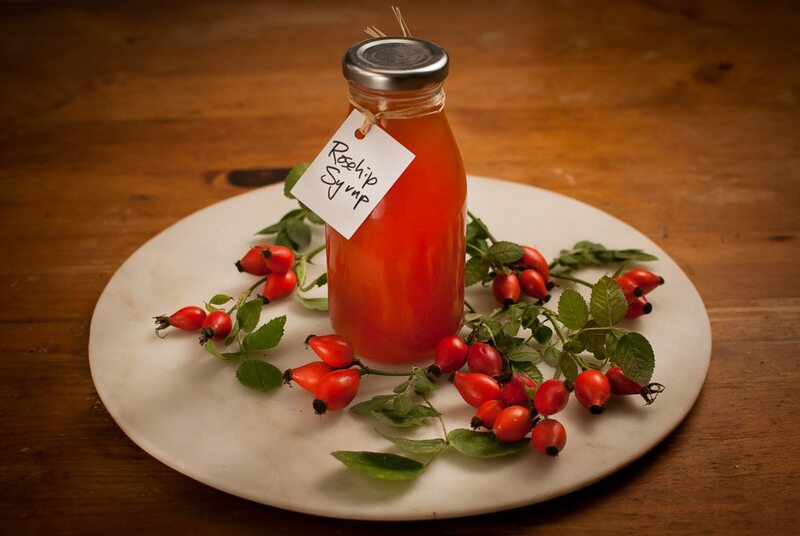 And as you can see we used the rosehips to make rosehip syrup. It’s full of vitamins and goodness. I might try it over a sponge, on ice cream, over shredded wheat, in yoghurt and added to a glass of fizzy water. Or I might just try by the spoonful as an autumnal medicinal tonic. First pick your rosehips – if you cannot collect 1 kg of trimmed hips, reduce the other ingredients in proportion. Use them straight away. Trim the hips from their stalks and wash.
Place the hips in a large pan and add half the water. Bring slowly to simmering point and blitz in a blender in stages. Return to the pan and let it steep for 10 minutes. Strain through a a sieve over another large pan and press the juice from the pulp. Put the pulp back into the first pan and add the remaining water. Bring to a gentle simmer for 10 minutes. Let it steep and cool for 10 minutes. Strain through a sieve again over the first amount of sieved juices. Press the juice through the sieve and discard the pulp. Strain the combined sieved juice into another pan through a sheet of muslin or a jelly bag. This may take some time – you can speed up the process by coercing the juice through the cloth or bag but you will risk making your syrup cloudy. Add the sugar to the strained juice and bring to the boil, stirring to dissolve the sugar, then keep heating until reduced by half. Sterilize jars by boiling and fill with the syrup. The syrup should last for months, but once opened the syrup should be kept in the fridge and used within a week or so.